Yesterday I attended the HAM Radio, an annual amateur radio exhibition taking place in Friedrichshafen, Germany. Like every year, I spent most of the time at the booth of Enigma expert Prof. Tom Perera, who exhibited a number of interesting encryption machines. Some of the people I met at this booth might be familiar to the readers of this blog, especially Klaus Kopacz and Jerry McCarthy. Two other old friends I regularly meet at the HAM Radio are Paul Reuvers and Marc Simons from Eindhoven, Netherlands. Paul and Marc not only have one of the largest cipher machine collections in the world, but they also operate the CyptoMuseum, a marvelous website dedicated to cipher equipment. 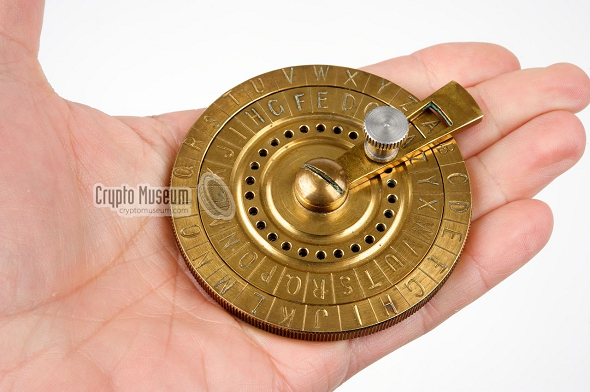 Apart from the pictures, Paul and Marc provide on their site, the CryptoMuseum features numerous well-researched descriptions of cipher machines with background information that is not available anywhere else. 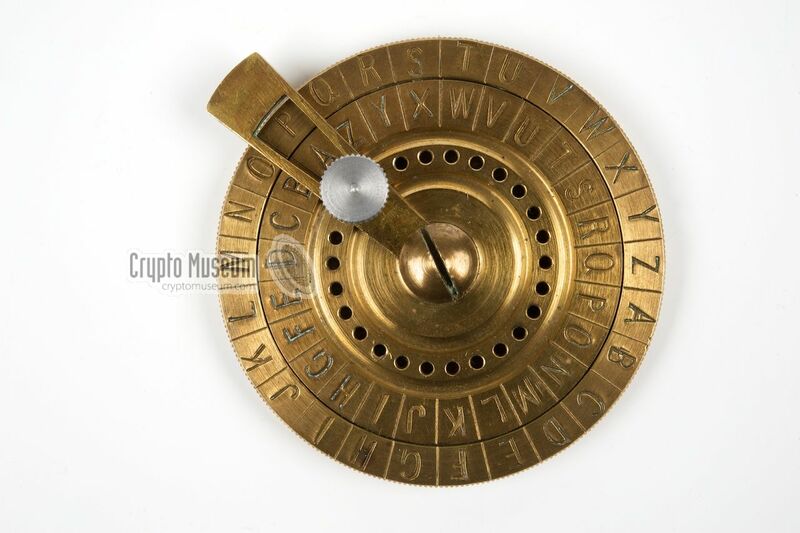 This cipher wheel was made by a company named “Linge” in Pleidelsheim near Stuttgart, Germany. The manufacturing date is unknown. My guess is that it was produced between 1920 and 1960. The disc does not have a serial number. 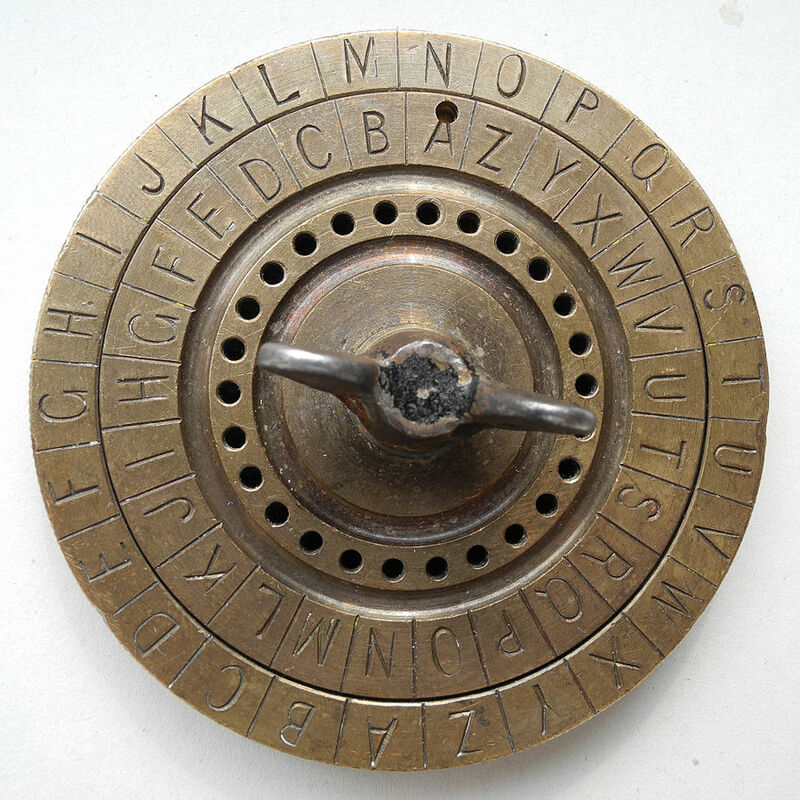 The device implements a variant of the well-known Caesar cipher of which the order of the alphabet on the inner disc is reversed. This encryption system is known as a Reverse Caesar Cipher. The advantage of the Reverse Caesar Cipher is that it is self-inverting – the same position of the movable wheel can be used for coding and decoding. It goes without saying that the Reverse Caesar Cipher is an extremely insecure encryption algorithm. The Linge cipher disc was therefore not suitable for serious encryption work. It is not known whether the designers of the disc were aware of this. The Linge cipher disc is milled out of a solid piece of brass. The outer ring has a milled-out area that holds the movable inner ring. It features a movable ruler that can be fixed in any of 26 positions by means of a knurled steel screw. This disc appears to be incomplete. It has an improvised bolt at the center and the ruler is missing. Furthermore is has a hole at the top of the letter ‘A’ of the inner disc. Can my readers find out more? The fabrication of the cipher disc appears to be inadequately expensive for such a primitive cipher. A similar device implementing the same algorithm could have easily been produced out of paper or cardboard. 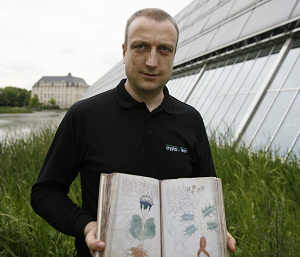 All this suggests that the Linge cipher wheel was not created by crypto experts. Maybe the development of this device was canceled when the makers realized that their design did not make much sense. If a reader can find out more about the Linge cipher disc, Paul, Marc and I would be very interested to know. Mein erster Gedanke: Eine Lehrlingsarbeit aus einer Metallwerkstatt, die nebenbei noch einen gewissen Sinn ergeben sollte. Dagegen spricht, dass der Firmenname eingraviert wurde.